The main empirical portions of the mechanistic-empirical design process are the equations used to compute the number of loading cycles to failure. These equations are derived by observing the performance of pavements and relating the type and extent of observed failure to an initial strain under various loads. Currently, two types of failure criteria are widely recognized, one relating to fatigue cracking and the other to rutting initiating in the subgrade. A third deflection-based criterion may be of use in special applications. Note that since these failure criteria are empirically established, they must be calibrated to specific local conditions and are generally not applicable on a national scale. The above equation defines failure as fatigue cracking over 10 percent of the wheelpath area. Figure 1 shows the relationship between tensile strain in the asphalt concrete and the number of cycles to failure for two levels of asphalt concrete elastic modulus. This relationship assumes bottom-up cracking rather than top-down cracking. Figure 1. Limiting horizontal strain criterion for HMA fatigue cracking. The above equation defines failure as 12.5 mm (0.5-inch) depressions in the wheelpaths of the pavement. 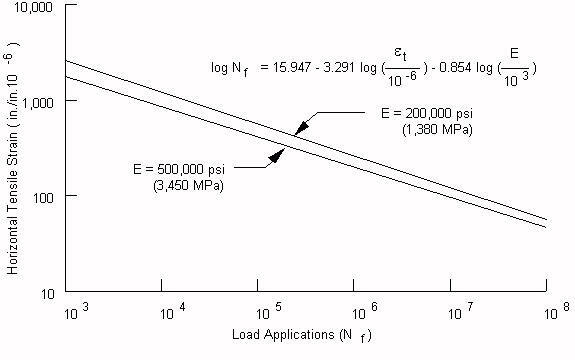 Figure 2 illustrates how the vertical compressive strain relates to the number of cycles to failure. 2. Limiting subgrade strain criterion for rutting. A number of deflection based criteria have been developed by various agencies over the last 40 years or so. The AASHO Road Test and Roads and Transportation Association of Canada (RTAC) criteria are shown here. Both these criteria were developed based on spring seasonal deflections.